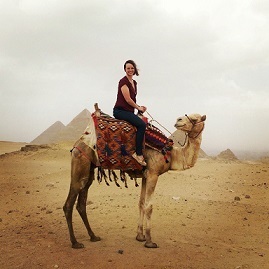 I’ve been dreaming of crossing another World Wonder off my bucket list for some time. When the opportunity came up to see Peru and reunite with my fellow traveling friend, Eric, Machu Picchu seemed like the perfect solution. I had been stateside since November and was itching to put on my backpack again. The two of us booked an Inca Trail trek to Machu Picchu, laced up our hiking boots, and set out on another adventure. Getting to Machu Picchu takes a bit of transportation and planning, which is why I was grateful for Machete Tours who coordinated everything. We flew into the capital city of Peru, Lima, then booked a regional flight to the historic city of Cusco. Our Peruvian tour guide, Jennifer, briefed Eric and I on what to expect the night before we departed for our two day trek. Eric, Jennifer, and I woke up in the wee hours of the morning to grab a taxi to Ollantaytambo Station, where we caught the train to Machu Picchu. The two hour taxi ride to the station took us through the rural villages of Cusco. I always enjoy driving through the country side so I can see how people from other parts of the world live their lives. The train took another 2 hours and the views were magnificent. We disembarked the train at the KM 106 to begin our trek. As we headed up to the first checkpoint to show our passports, I noticed I had already lost my water bottle..fail! I raced back to the train tracks where I was able to scout it out. At least I think it was mine. Eric, Jennifer, and I went through the checkpoint lathered up with sunscreen and bug spray before hiking to our first stop - Choquesuysuy. Jennifer gave us a brief history of the Incas before we continued. The Incas held the largest and most sophisticated empire on earth stretching 4,300 miles along South America. They created an efficient highway system linking the coasts, mountains, and jungles. Despite having no written language, the Incas were expert engineers and architects. To feed the people of the growing empire, the Incas terraced the mountain lands, built irrigation systems, and experimented with different crops. As we continued along the trail, the "real trek" began. The incline of the mountain began immediately and so did the burning of my thighs. We zig-zagged across the mountain and stopped every so often, because Eric and I, though relatively fit, struggled with the altitude and steep terrain. Jennifer continued to cheer us on and tell us facts about the flowers and different ecosystems in the mountain range, making the trek enjoyable while we caught our breath. On one of our breaks, we spotted the infamous Machu Picchu llamas coming towards. The pack of llamas that roam the mountains of Machu Picchu were born and raised around tourists, which means they LOVE selfies! These fuzzy and photogenic creatures are close cousins to alpacas and descend from the camel species. The Incas domesticated the llamas over 4,000 years ago. In fact, llamas were so important to the Incas it was forbidden to hunt them and priests used them in religious ceremonies. Llama herders were even considered part of nobility! Don’t confuse a llama with an alpaca. Llamas are almost twice as large and have tall, banana shaped ears, with a longer face. Their fur is coarser than an alpaca, which is why alpaca fur is commonly used for blankets and clothing. After pulling myself together and getting a few shots with my fuzzy friends, the three of us continued on our trek. We rounded a corner and what I saw in front of me took my breath away. Straight ahead was an impossibly steep mountain with terraces carved with absolute precision. Wiñay Wayna, meaning “forever young” in the local Quechua language, was my favorite site on the trek (yes, even better than Machu Picchu). The terraces are gracefully constructed into the mountainside overlooking the sacred Urubamba River. Contrary to what you may think, the terraces weren’t built for aesthetics, they provided structure to the mountain to prevent erosion and allowed for precise agricultural practices. 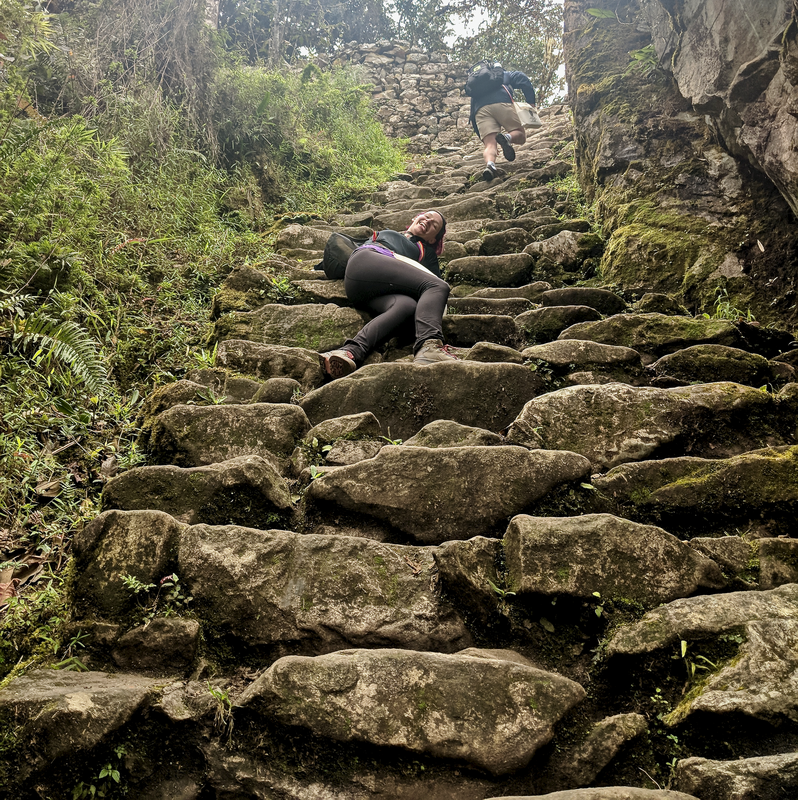 When you walk down the steps of Wiñay Wayna, you can feel the temperature change. The Incas used this to their advantage and strategically planted crops that were best suited to the climate. They even constructed an intricate series of water fountains or baths along the steps using water from the nearby melting glacier. Jennifer explained how the Incas were also expert architects. The structures were built to survive erosion and frequent earthquakes. Often times you’ll see windows shaped like a trapezoid, this isn’t for aesthetics, but to create additional support for the stone walls. Eric and I walked through the beautiful and eerie ruins. I felt awestruck and recharged. Our trio said goodbye to the ruins and continued our trek across the mountain. Fortunately, for Eric and I the rest of the trek was on a less intense incline. When we had started the trek, we were surrounded by dry climate, now we entered into the rainforest. The temperature changed from a sweltering heat to a cool humidity. As we rounded a corner, we found a small building. Remember how I mentioned the Incas had no written language? They used chasquis or messengers, to convey information from one person to the next. Eric joked that it was an intense game of telephone. As we continued our trek we saw the Inca’s version of a hostel. Little huts where the chasquis could spend the night. Throughout the trek, Jennifer joked about the upcoming “Gringo Killer” stairs. There are 50 stairs that are so steep it supposedly makes white hikers “want to die.” I was looking face to face with the Gringo Killer - yep, it was steep, but not THAT bad. Jennifer recommended "crawling" up the stairs instead of climbing to give yourself extra stability. I had to take advantage of a good “dead hiker” look photo-op. With the afternoon winding down, we knew our final destination was quickly approaching - Sun Gate - the entrance to Machu Picchu. As we approached the last bit of the climb, the view of the magnificent Machu Picchu lay ahead of us. 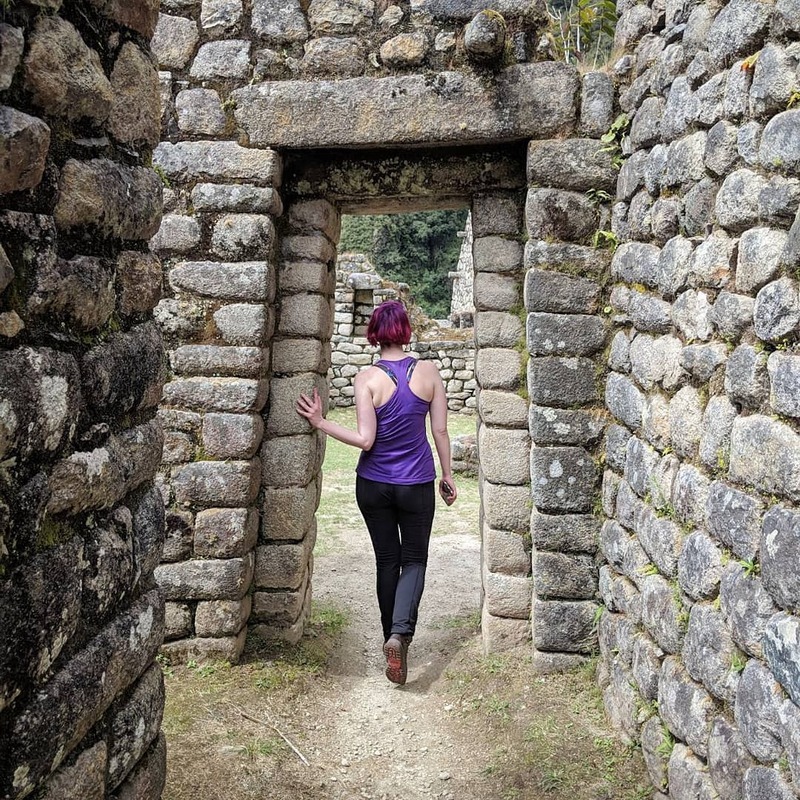 Read about Day 2 on the Inca Trail and the nooks and crannies of Machu Picchu!